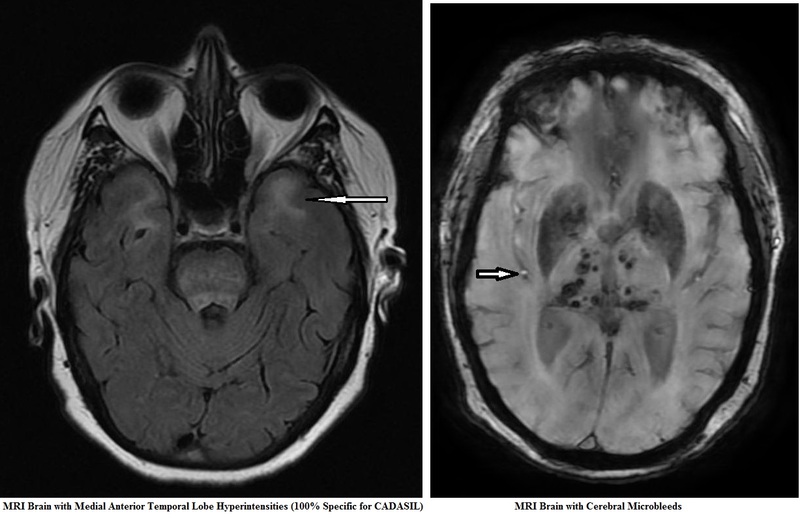 CADASIL is Cerebral autosomal dominant arteriopathy with subcortical infarcts and leucoencephalopathy. CADASIL causes a small vessel non arteriosclerotic non-amyloid microangiopathy. Eventually leading to disability and dementia. It causes migraine with aura in less than half. There is an Autosomal recessive (CARASIL) mentioned below. Has been mapped to an inherited mutated NOTCH3 gene at chromosome 19p13.1. A mouse model of CADASIL has shown increased susceptibility to cortical spreading depression . Gradual accumulation of NOTCH3 protein around vascular smooth muscle cells and pericytes along with Granular osmiophilic material (GOM) within media and adventitia. Migraine with aura: is seen in up to 40% of patients and is often the first pinpoint signs and often starts age less than 30. It is seen in a minority so one should not rely on its presence to suspect the diagnosis. Migraine often complex with vision and sensory symptoms.In some Migraine with aura is severe and predominant. 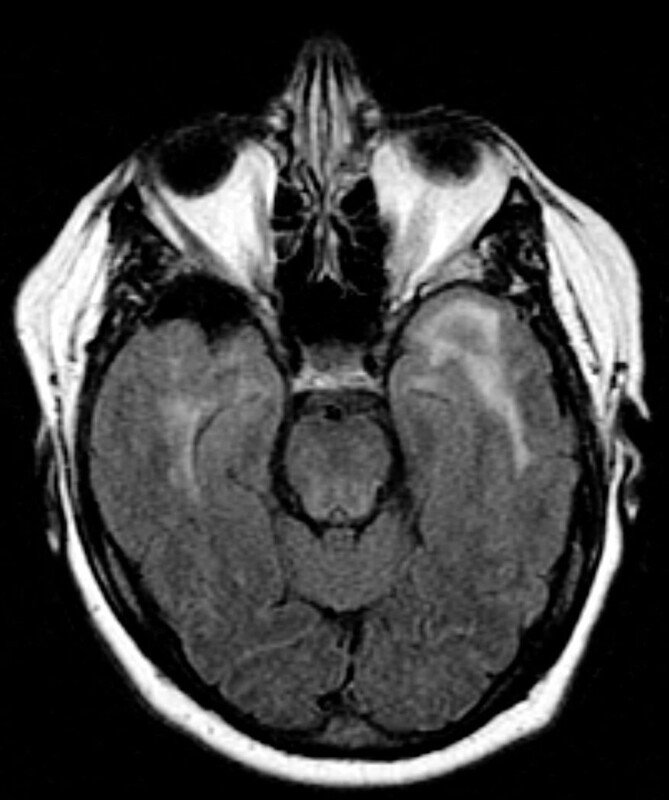 Subcortical ischaemic lesions: presenting as lacunar syndromes are usually found in the late 40s/ early 50s. May be compounded by other vascular risk factors e.g smoking, diabetes and hypertension. Psychiatric features: mood disturbance may be seen with anxiety, depression and mania/depressive periods. Apathy is common. Cognitive impairment: may be detectable cognitive issues from the 40s onwards . There is ongoing worsening and by the late 60s dementia is severe. There can be episodes of confusion and reduced consciousness lasting hours or days, sometimes with fever and seizures often after a migraine attack. This is known as encephalopathy. It recovers completely over 1 to 2 weeks and has no long-term effect on the course of the disease. Progressive neurology: progressive gait dyspraxia, urinary incontinence, and pseudobulbar palsy. Less commonly seizures and parkinsonism can occur. The main organ affected is the brain but there is also evidence that there may be more systemic manifestations as GOM deposits are found in the skin. Renal changes maybe seen. There is a need for more study into systemic effects. Bloods: no specific findings. ECG: SR or AF which is probably unrelated. CT Brain: may just show small vessel changes with widespread periventricular changes as time progresses. MRI Brain: is useful and demonstrates prominent subcortical white matter changes and lacunar infarcts are often symmetrical and periventricular and particularly located to anterior temporal lobes and external capsule. These may be detectable from the mid 30s onwards. There is sparing of the cortex and subcortical U-fibres. These locations are quite specific for CADASIL. Lesions may also be found in basal ganglia and thalamus. Microbleeds are also found in approximately 50% on gradient echo (T2*). There is progressive brain atrophy. Brain Histology: which is not routinely undertaken shows chronic small artery disease in periventricular space, centrum semiovale and basal ganglia. Cortical layers 3 and 5 show apoptosis. Vessels show eosinophilic deposits in tunica media of arteries in brain . There is progressive luminal stenosis and occlusion. These changes are also found in skeletal muscle and skin. Skin biopsy: with staining with NOTCH3 monoclonal antibody reveals excess NOTCH3 protein in the vessel wall. This is highly sensitive(85-95%) and specific (95-100%). 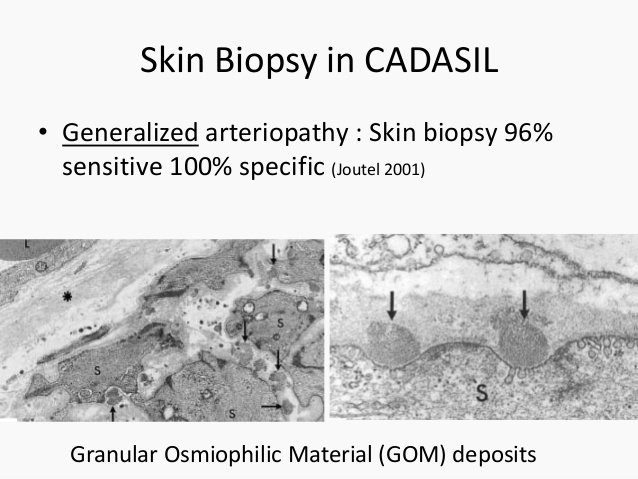 Skin biopsy also demonstrates the presence of Granular osmiophilic material (GOM) which is best seen by electron microscopy within media and adventitia of the small subcutaneous arterioles which is diagnostic for CADASIL. Genetic Testing should be done on those with the classical phenotype of family history and migraine with aura and subcortical strokes. Without a family history care must be taken. The presence in patients with migraine with aura of some T2 hyperintensities is not uncommon. 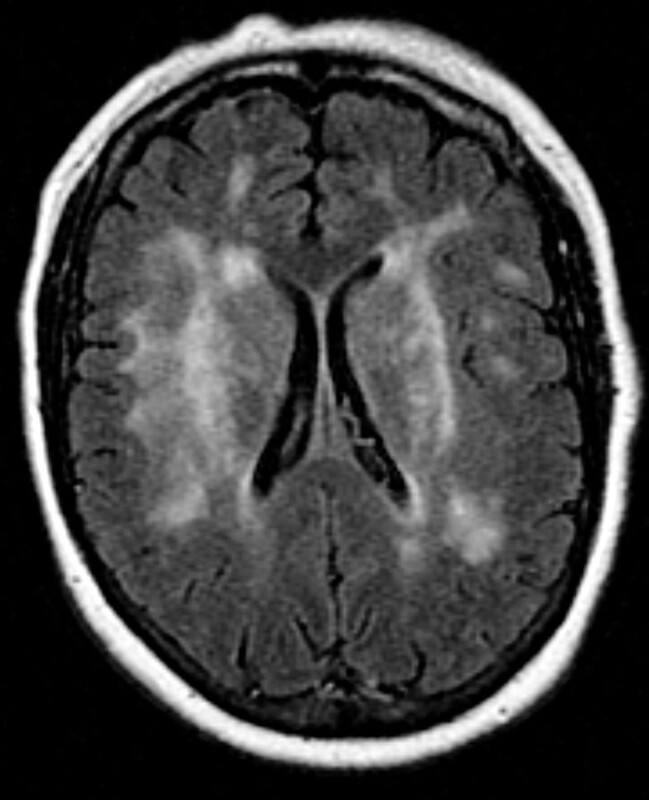 Classical tip: White matter changes in the anterior temporal pole and in the external capsule can serve as a useful neuroimaging marker for the diagnosis, and moderate to severe changes in the anterior temporal pole may have sensitivity of 89% and specificity of 86% for CADASIL, whereas lesions in the external capsule show high sensitivity (93%) but low specificity (45%). Microbleeds may also be seen. There is no specific disease altering therapy and an affected 30 year old patient with new migraine with aura may wait 30 years for their first stroke. No smoking, good BP control and mangement and avoidance of usual stroke risks seems prudent especially when there is known genetic predisposition. Some patients take L-arginine which they find may improve migraines, fatigue, and/or other quality of life issues but there is no evidence base. Some family members may request screening and this must be done with approprate support and counselling. Some may see little benefit in testing especially without clear evidence of an intervention that may alter outcome . The role of prenatal screening is unclear. Is an acronym for Cerebral Autosomal Recessive Arteriopathy with Subcortical Infarcts and Leukoencephalopathy (CARASIL) and is similar to CADASIL but autosomal recessive and very rare. Identified mainly in China and Japan. CARASIL is caused by mutations in the HTRA1 gene. Patients present a decade younger in their 30s. Patients present with ischaemic stroke or a stepwise deterioration in brain functions. There is a progressive euphoria and emotional lability, dementia, premature baldness, and attacks of severe low back pain or spondylosis deformans/disk herniation. Imaging by MRI shows diffuse white matter changes and multiple lacunar infarctions in the basal ganglia and thalamus. Histopathologically identifies intense arteriosclerosis, mainly in the small penetrating arteries, without granular osmiophilic materials or amyloid deposition . Diagnostic strategies in CADASIL. Neurology. 2002 Oct 22;59(8):1134-8. Grover S, Kataria KK, Bansal V. Chronic Leg Weakness in a Patient with Depression. How About Cadasil? [abstract]. Journal of Hospital Medicine. 2016; 11 (suppl 1). https://www.shmabstracts.com/abstract/chronic-leg-weakness-in-a-patient-with-depression-how-about-cadasil/. Welcome to the CADASIL website; a resource for those diagnosed with CADASIL, their relatives and carers. Chaubriat H et al. CADASIL. Lancet Neurol. 2009 Jul;8(7):643-53. doi: 10.1016/S1474-4422(09)70127-9. Eikermann-Haerter K et al. CADASIL MUTATIONS INCREASE SUSCEPTIBILITY TO SPREADING DEPRESSION. Ann Neurol. 2011 Feb; 69(2): 413–418.